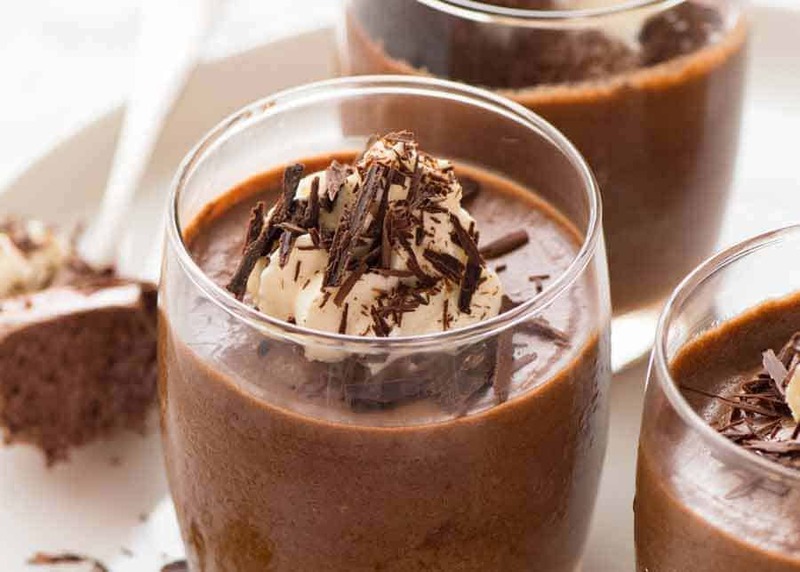 Chocolate Mousse may well be the ultimate chocolate fix! Rich and creamy, yet light and fluffy, one pot is satisfying but always leaves me wanting more……. 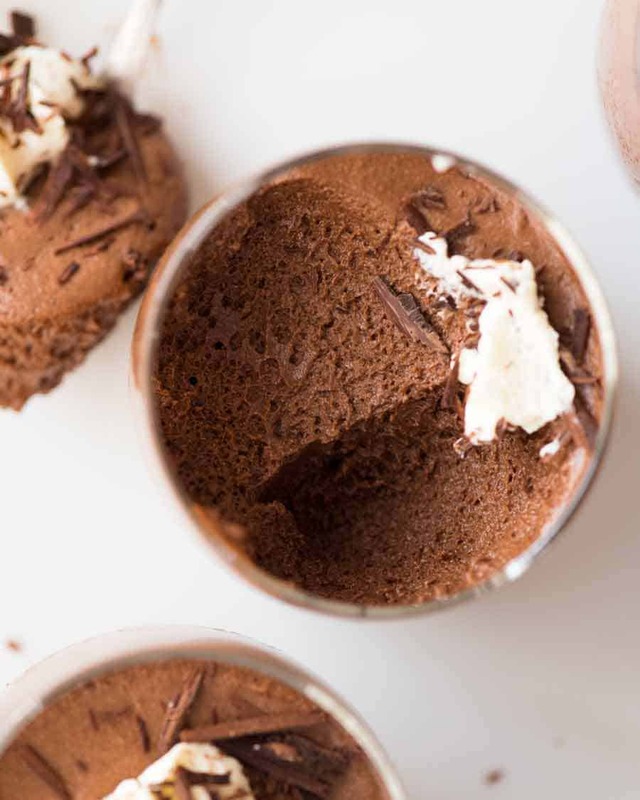 And you’re just five simple ingredients away from these little pots of chocolate heaven!!! I’ve never been 100% happy with the various chocolate mousse recipes I’ve tried in my lifetime. Not fluffy enough, not chocolatey enough, too sweet, grainy, etc etc. Thus, when Chocolate Mousse was submitted by a reader as a Recipe Request, I had reason to focus and make it over and over again until it was exactly what I wanted. Let me repeat: I had to make chocolate mousse over and over again for work purposes. Just FIVE ingredients, all good stuff we like: chocolate, cream, sugar, eggs and butter. We (the RecipeTin Family) tried this with various types of chocolate – bittersweet dark chocolate / 60 to 70% cocoa dark (best at supermarket plus from speciality store), standard dark and milk chocolate chips (semi-sweet in US/CAN), usually around 30% cocoa. The darker the chocolate (ie higher cocoa %) = more intense chocolatey flavour and high quality bittersweet dark chocolate is what good restaurants typically use. But even milk chocolate is lovely in this recipe. 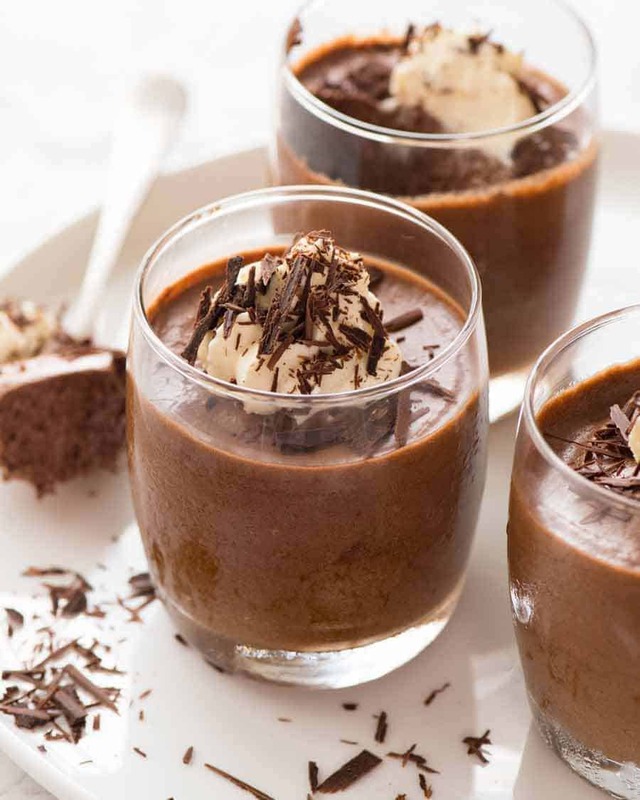 Chocolatey enough – I think partly because this chocolate mousse recipe uses less sugar than many. I would happily serve milk chocolate mousse to company. All types of chocolate are great and it comes down to personal taste. I typically use 70% cocoa dark chocolate (which is a bittersweet dark chocolate) because it has a good intense chocolate flavour, it’s not as sweet as milk chocolate and I don’t need to hunt down a gourmet store to find it because it’s sold at supermarkets. Fold the ingredients into each other. Don’t beat furiously – that’s the sure fire way to a pot of liquid chocolate! Spoon into individual pots or a larger dish, chill until firm. The recipe video is super helpful to see the consistency of the egg whites and cream, as well as how to fold the ingredients into each other. I chose to make little pots (using whisky glasses!) but you can make one dish if you prefer, then scoop out to serve. FIRST TIMERS – NEVER FEAR! If you’re a chocolate mousse first timer and are concerned about deflation because you’re taking your time with the steps, don’t be worried! When I film recipe videos, I’m always faffing around with camera set ups and batting away a certain giant dog who is always sprawled where I want the tripod to be. So it probably took me 3 times longer than it usually does to get the mousse in the fridge so I was quite concerned about deflation of the egg whites and cream. PS More ways to get a serious Chocolate fix: Chocolate Cake with Chocolate Buttercream Frosting, Chocolate Cream Pie and BROWNIES! Recipe video above. 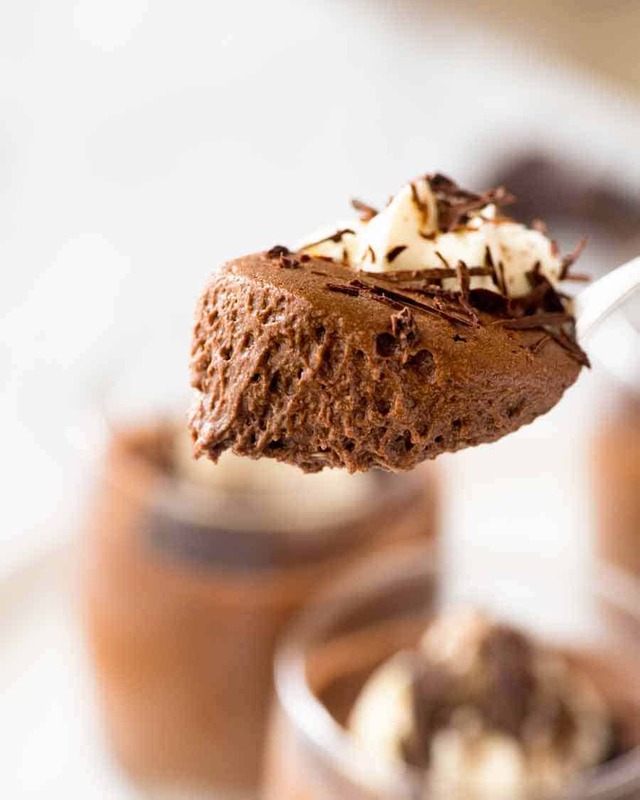 Light and airy yet rich, the iconic Chocolate Mousse is actually quite straight forward to make. The video is extra helpful for this recipe – so you can see how stiff the egg whites and cream are, and more importantly, how to fold the ingredients into each other so you don’t end up with deflated mousse! 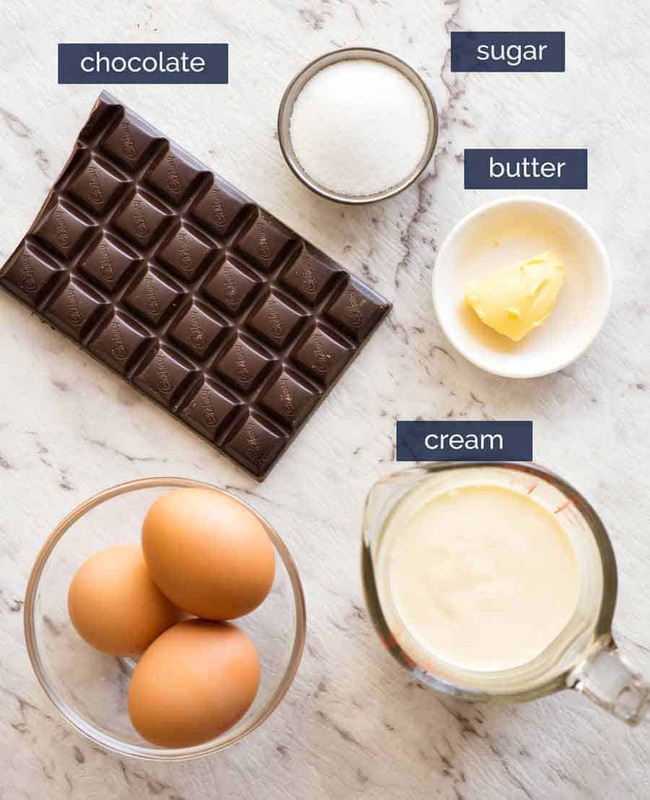 Melt Chocolate: Place chocolate and butter in a bowl. Melt in the microwave in 30 second bursts, stirring in between, until smooth. Set aside to cool – proceed with other steps. Cream: Beat cream until stiff peaks form (see video). Fold egg yolks into cream using a rubber spatula – 8 folds max. Streaks is ok. Check Chocolate Temp: Touch the chocolate. Should still be runny but only lukewarm. If too thick, microwave 2 x 3 seconds until runny. Pour chocolate into cream yolk mixture. Fold through – 8 folds max. Streaks ok.
Add 1/4 of beaten egg whites into chocolate mixture. Fold through until incorporated – “smear” the spatular across surface to blend white lumps in – aim for 10 folds. 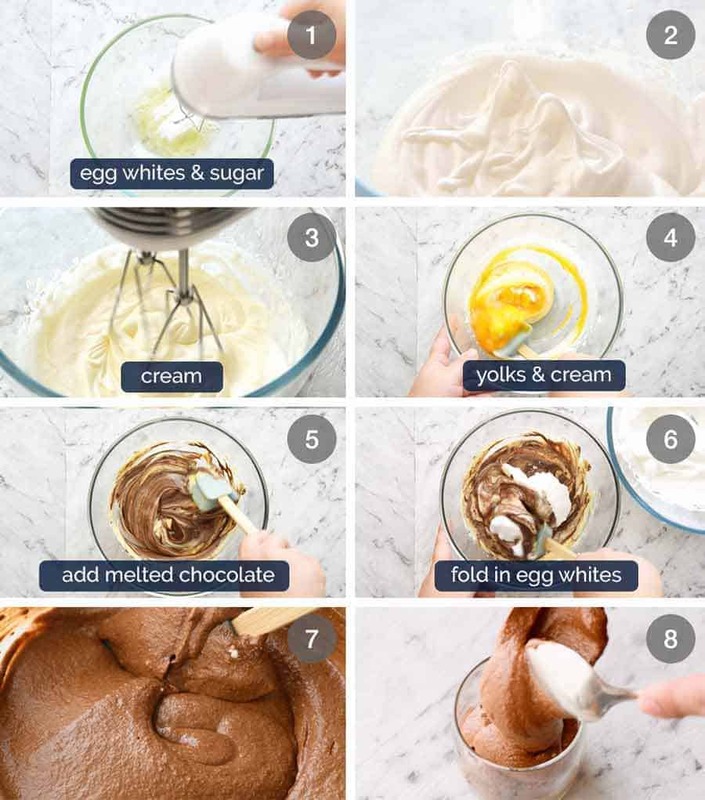 Pour chocolate mixture into egg whites. Fold through until incorporated and no more white lumps remain – aim for 12 folds max. Divide mixture between 4 small glasses or pots. Refrigerate for at least 5 hours, preferably overnight. To serve, garnish with cream and chocolate shavings. Raspberries and a tiny sprig of mint for colour would also be lovely! 1. Chocolate: Ensure you use COOKING chocolate, not eating chocolate. Cooking chocolate (baking aisle) is made for cooking with – melts smoothly and is thinner than eating chocolate. If you use eating chocolate, the mousse is denser (I tried). Bittersweet dark chocolate and 70% cocoa dark chocolate is best to get a good chocolatey flavour. The 70% cocoa sold at supermarkets in Australia is ideal (Nestle Plaistowe, Cadbury and Lindt 70% all work well) – these are bittersweet chocolates. 2. Cream: Must use whipping cream (there are some creams only for pouring that don’t whip). Must be full fat – now is not the time to go low fat! 3. Chocolate Shavings: Use a small knife and scrape at a low angle on the flat side of a block of chocolate. 4. Eggs tip: It’s easier to separate whites from yolks when eggs are cold, but whites at room temp fluff up better when closer to room temp. So separate the eggs when fridge cold then set aside while you prep the other ingredients to let the whites come to room temp a bit. 5. Beaten whites consistency: Egg whites can be beaten to: soft peaks, firm and stiff peaks. We want the middle one – firm peaks. This is when you have a “elf hat” floppage at the top of the peak (see video). If it stands straight upright without the little hook then it’s stiff, not firm (still works fine but it won’t hold up as well after a few days in the fridge). If you do not get any type of peaks at all, then keep beating! 6. Storage: Best within 2 days but keeps for a week in the fridge with only a slight reduction in aeration. 8. Nutrition per serving. Makes 4 x 1/2 cup (125ml) servings. It is quite rich! 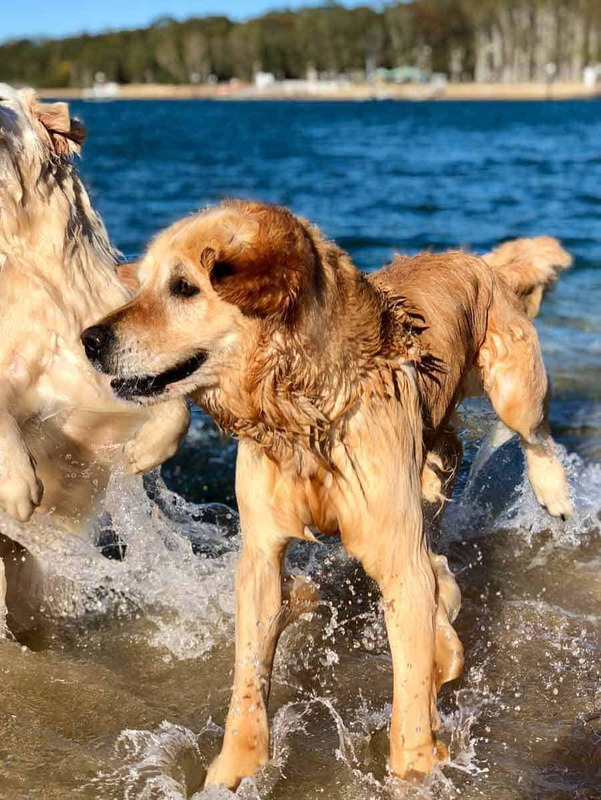 Back at the beach with his mates! Under strict instructions to take it easy* and ease back into it. Unfortunately, he doesn’t understand what “taking it easy” means…..
* Post knee op a few months ago. According to Dozer, he was back to 100% the week after surgery, but the doc says no! It will be months! 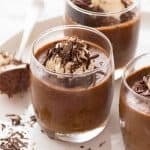 The post Chocolate Mousse appeared first on RecipeTin Eats.